These General Sales Conditions shall be applicable between the customer, hereinafter “the Buyer” and the company Jacquet Pêche S.A. (hereinafter www.jacquet-peche.com), whose registered office is located at 10 rue Albert 1er, B-6810 PIN (Belgium). Any order placed on the site www.jacquet-peche.com implies the Buyer’s complete and unconditional acceptance of these General Sales Conditions. These General Sales Conditions shall also prevail over any other general or particular terms and conditions, unless otherwise expressly agreed by Jacquet Pêche S.A. These transport conditions, transport costs and return of material conditions are only applicable for products that are purchased on the site www.jacquet-peche.com. The General Conditions are available for the Buyer on the site, under the page “Conditions de vente” / “Sales Conditions”. Jacquet Pêche S.A.reserves the right to modify its sales terms and conditions at any time. In this case, the applicable conditions shall be the conditions that are valid at the time of order by the Buyer. The products for sale are only those listed in the online catalogue on the site www.jacquet-peche.com while supplies last. Detailed information is provided for each product (technical data, content, …). Jacquet Pêche S.A. shall not be held responsible for any mistake or default whatsoever. The pictures of the products for sale are as accurate as possible but cannot ensure complete similarity with the products offered for sale, namely as far as colors are concerned. Therefore,Jacquet Pêche S.A. shall not be held responsible for any possible differences between the picture and the actual product. Furthermore, Jacquet Pêche S.A. cannot be held responsible for damages of any nature that may result from malfunction or improper use of the products offered for sale and/or their packaging, whatever that may be. The prices listed in the catalogue are VAT inclusive and are subject to modification without prior notice. However, any Buyer who formally confirmed and paid for his order at a certain time shall be given the prices mentioned at the time of order. The listed prices are only valid while supplies last. The prices mentioned in the confirmation of order include the price of the products, as well as the transport and packaging costs (insurance, VAT, customs duty or any other local tax). The prices mentioned in a different currency, if any, are merely provided as an indication. Germany, Austria, Belgium, Denmark, Spain, Finland, France, Hungary, Italy, Ireland, Luxembourg, Netherlands, Poland, Portugal, the United Kingdom, Slovenia, Slovakia, Sweden, and Czech republic. The delivery fees are calculated, in an automatic way, on the website www.jacquet-peche.com, according to the measures and the weight of your parcel and the country of destinations. 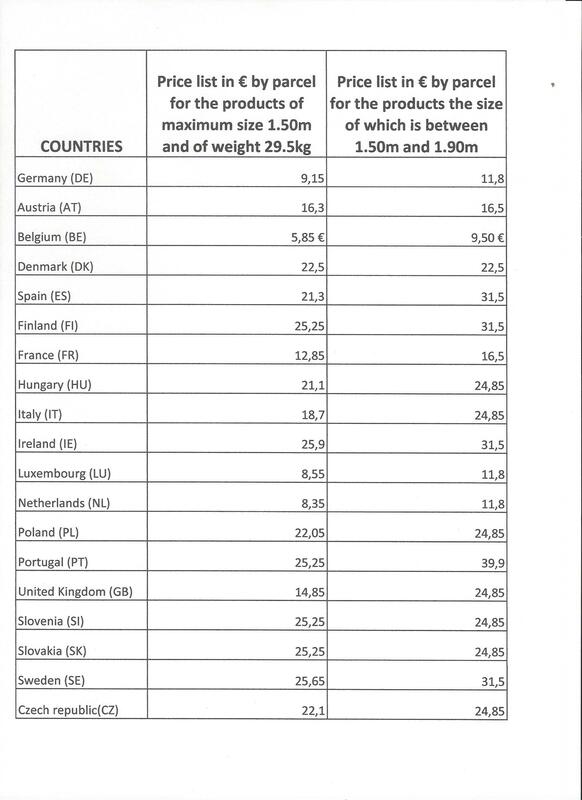 If only the « Withdrawal in store » is proposed, your parcel is not standard in weight and/or size. Please then contact us for the delivery fees. 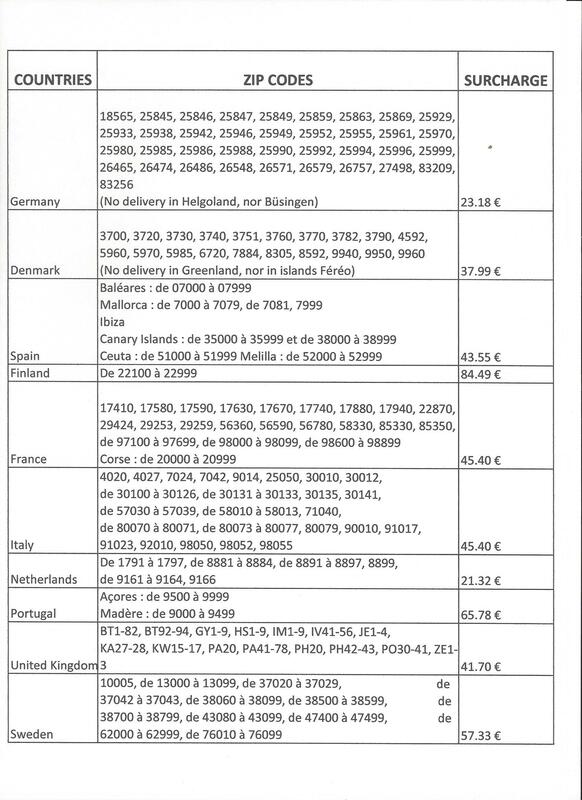 Some destinations generate however, a supplement of delivery charges. Please find the details below. Jacquet Pêche S.A. reserves the right to apply additional costs for the “islander deliveries”. These additional costs will be separately charged. Jacquet Pêche S.A. can’t be held responsible for these surcharges of delivery fees and/or for the impossibility of the delivery. The orders made to Jacquet Pêche S.A. shall be exclusively placed on the site www.jacquet-peche.com. Any order placed by mail, fax, e-mail or phone shall not be taken into consideration, except for exceptional circumstances (e.g. website failure, …). Confirm his order and payment by clicking on the corresponding icons. The confirmation of order implies the full acceptance of these General Sales Conditions, and the express agreement that they are clearly understood, as well as the renunciation to make use of the Buyer’s own purchase conditions or any other terms and conditions. All of the provided data and the registration of confirmation shall constitute a proof of the transaction. The confirmation is worth a signature and implies the agreement to the business transaction made. Any purchase order validated by the Buyer shall constitute an irrevocable acceptance which can only be questioned in the limits foreseen in the present General Conditions under the article “Right of withdrawal”. In case of default of payment by the Buyer within a period of 15 days, Jacquet Pêche S.A. reserves the right to cancel the order. Jacquet Pêche S.A. shall send the order confirmation by e-mail. If the ordered product is not available, Jacquet Pêche S.A. shall immediately inform the Buyer by e-mail and mention the delivery time that will be necessary for the product to arrive. If the Buyer is not satisfied with the aforementioned delivery time, he has the right to either modify or cancel his order. The orders for which the total weight is upper in 29.5 kgs and/or the length is more than 1.90 meter will be to remove in store. These parcel being not standard, it will however be possible to contact us to establish a quotation for shipping costs. Only individuals who are legally capable of concluding contracts are allowed to place an order. The price of the order must be paid cash using one of the payment methods offered on the website on the date of order, namely by wire transfer or online payment. Online payment is totally managed and secured. Any order that has been validated by its Buyer shall be considered valid only after the payment transaction is accepted. In the event of payment refusal by the secured banking system, the order shall be automatically canceled and the Buyer shall be informed by e-mail. After confirmation of the order has been issued and payment has been accepted, Jacquet Pêche S.A. commits to have the ordered products delivered to the delivery address mentioned by the Buyer within a reasonable delivery time. The reasonability of the delivery time is defined in accordance with the geographical area to which the order has to be delivered. The delivery times vary in accordance with the geographical areas that are specific to the consignee’s delivery address. These delivery times are provided for information purposes only and may vary according to several factors that are beyond our control (delivery method, bad weather, strikes, …). No compensation may be asked to Jacquet Pêche S.A. or to the carrier by the Buyer in case of late delivery, except in case of actual proven mistake. Upon receipt of the ordered products, the Buyer or the consignee must check the good condition of the products. In the event of an absence or damage of a product, the Buyer or the consignee must refuse the parcel to the carrier immediately and send a registered mail to Jacquet Pêche S.A.(10 rue Albert 1er, B-6810 PIN) within 48 hours or an e-mail to the same company. In the event that a package is not being received by the consignee due to the consignee’s absence or if the package is picked up late or fails to be picked up (after delivery notice of the carrier), Jacquet Pêche S.A. shall not be held responsible for any of these events. For a delivery in Belgium, the law of 6 April 2010 grants to any non-professional buyer a right of withdrawal of 14 days from the moment of delivery of his order. The Buyer may exercise his right of withdrawal by sending his decision to withdraw from the present contract through registered mail within 14 days from the moment of delivery of his order, to Jacquet Pêche S.A. (10 rue Albert 1er, B-6810 PIN, Belgium). The decision to withdraw shall imperatively contain the following information (Date, Last name, First name, and address of the Buyer, Date and number of the order, Signature of the Buyer) and must be sent before expiry of the withdrawal period. In the event of withdrawal from the present contract by the Buyer, Jacquet Pêche S.A. shall reimburse the payment of the product or products that are subject to the withdrawal, including the delivery costs (except for those extra costs that result from the Buyer’s decision, if any, to choose a different delivery method than the standard and cheaper delivery method offered by Jacquet Pêche S.A.), without unreasonable delay and, in any case, upon receipt of the returned package. The Buyer shall be reimbursed only if the returned product or products are sent back in their original condition and packaging. The return costs shall be borne by the Buyer. The legal warranty will only apply if the non-compliance is noticed within 2 years from the moment of delivery of the product. Therefore, the period of legal warranty starts from the moment of delivery of the good. If the notification is made more than six months after delivery, the Buyer has the obligation to prove the existence of the non-compliance at the time of delivery. The warranty is only valid within countries of the European Union. JACQUET PECHE provides a 2-year warranty on each fishing rod purchased either on its website or in store. - The breaks that occur outside of the fishing actions or due to improper use. - The breaks that are caused by a line diameter that does not match your fishing rod (please refer to the indications proper to each rod or check with us directly if you have any doubt). - Any material that is being provided without proof of purchase: our providers request a proof of purchase. Any break due to a shock on the fishing rod blank. All of our fishing reels are guaranteed for 2 years. - Impacts on the reel. - Improper use in salted water. Not all models are suitable for salted water and, in any case, they require immediate rinsing after each fishing trip. Please check with us if you have any doubt. - Any material provided without proof of purchase: our providers request a proof of purchase. The seams, gluing and assembly are guaranteed for 2 years. Any tearing or holes caused by bramble bushes or other objects are not covered by the warranty. We recommend that you rinse and dry your waders after each fishing trip. Avoid any contact with warm surfaces (such as heaters) that may damage the different materials. There is a 2-year warranty on all of our inflatable boats. All of our electronic products are guaranteed for 2 years (bite alarms, baiting boats, fishfinders, motors). This warranty is valid only if the product has not been opened or modified. NOTE : Please always make sure to check the content of your package in the presence of the carrier. If you notice any damage on your package upon arrival, we highly recommend that you check the condition of your material before signing the receipt. Prior to any return of material, the Buyer shall contact Jacquet Pêche S.A and obtain a confirmation that the product may be returned. The Buyer may contact us via phone, e-mail or via the contact form on our website in order to tell us why it is being returned. If possible, he shall also join a picture of the problem. A copy of the original invoice shall be annexed to the returned package. The shipping costs (including insurance) of the defective product to be returned to our company shall be borne by the Buyer (even if the product is still under warranty). The warranty does not cover normal wear and tear, shocks and accidents, crushing, improper or abusive use, bad maintenance, negligence, falls, external causes to the material. The warranty is limited to the replacement, reimbursement or repair of the product. The INVOICE is worth a WARRANTY and therefore, it is extremely important that you keep your invoice ! The warranty shall not be valid if the customer (or a third party acting on his behalf) brings a product to be repaired by himself and without our prior agreement. In the event of a product that is not covered by a warranty, the shipping and/or packaging costs to return it to the Buyer shall be borne by the latter. It is the responsibility of the Buyer to check the package or packages upon delivery and it must be done carefully BEFORE signing the delivery note. The Buyer must imperatively check the content of the package or packages even if they appear to be undamaged! The delivery person has the obligation to allow the Buyer to check his material. In the event where one or several items are damaged, it is imperative that the Buyer refuses the delivery and clearly writes down the reason of refusal, detailing which items are not conform (including item references, names and quantities). If possible, we recommend that the Buyer takes a picture of the item(s). In the event where one or several items are missing, it is imperative that the Buyer clearly indicates the list of the missing items on the carrier’s delivery note (including item references, names and quantities). In case of problem, besides writing down any reserve on the carrier’s delivery note, it is important that the Buyer sends a REGISTERED mail within 48 hours to the carrier, listing all the details (damage, missing items, …) and an extra copy immediately to Jacquet Pêche S.A. (including the customer and invoice numbers) so that Jacquet Pêche S.A. can quickly fix the problem. If no reserve is clearly detailed on the delivery note and if the Buyer fails to notify any problem to the carrier within 48 hours, Jacquet Pêche S.A. shall not proceed to the reimbursement or exchange of the product to the Buyer; this applies to missing or damaged items. The transfer of ownership of the product only occurs after full payment of the price. However, during the period between the delivery and the transfer of ownership, any risk of loss, theft or destruction remains to the responsibility of the Buyer. Default of payment by the Buyer for any reason whatsoever gives Jacquet Pêche S.A. the right to request the immediate restitution of the delivered goods, at the Buyer’s own costs and risks. Jacquet Pêche S.A. shall not be held responsible for any inconvenience or damage resulting from the use of the Internet network, namely, service breakdown, outside intrusion such as the presence of a computer virus or any other fact qualified as force majeure, in accordance with the state law. In any event, the responsibility of Jacquet Pêche S.A. shall be limited to the amount of the order and shall not be assumed for simple errors or omissions that may have subsisted despite all the precautions it has taken in presenting its products. This section describes the applicable rules on the website www.jacquet-peche.com with respect to the protection of personal data, as well as to the processing of all data which is collected during or as a consequence of your visit to this website. While registering to the site www.jacquet-peche.com and/or placing an order, you will be asked to provide certain personal data. This personal data is necessary to ensure a proper and efficient functioning of our web shop. The data is used to provide you with the expected goods and services. The provided data is registered in the system of Jacquet Pêche S.A. www.jacquet-peche.com. In order to perform certain tasks, Jacquet Pêche S.A. uses other companies’ services (e.g., for technical maintenance of our website, extra support during marketing campaigns, etc.). These companies only have limited access to your personal details to be able to carry out their respective assignments. Your personal data shall neither be sold nor forwarded to third parties, nor made public. However, Jacquet Pêche S.A. reserves the right to use your data or to make it public if the law so requires, if the processing of data is of critical importance to you, if the processing of data must be used to perform a task of public interest or if the processing of data is necessary to defend an interest in Court. With respect to the secure card payments, Jacquet Pêche S.A. neither has access to, nor stores your security codes; such codes are only transmitted to the banks and financial institutions at the time of payment and are encrypted. NEVER GIVE YOUR PERSONAL CODES BY PHONE, MAIL OR E-MAIL: if you do, someone may use your personal codes to their own benefits. All data, texts, pictures, logos and designs displayed on our site www.jacquet-peche.com may neither be copied nor reproduced without our prior and written consent. You have the right to access your personal data and to modify it by clicking on the option “Your Account” in the scroll-down menu “Mon menu” / “My menu”. You also have the right to oppose, free of charge, the use of your personal data for direct marketing purpose. The cookies are small files that are temporarily saved on your hard disk, through the website. These small files make web browsing easier and significantly contribute to the usability of the website. If you wish to be informed by your Internet browser of the transmission of a cookie, you may change your browser settings accordingly. If you do not wish to receive any cookie, you may choose the setting “do not authorize cookies” in your browser settings. You will not receive any more cookies by doing so. However, this may also imply the loss of other functionalities and the loss of easier use of the website. For all sales made by Jacquet Pêche S.A., the Belgian law is applicable. The contractual information is in French and the offered products are compliant to the Belgian law. If need be, it is responsibility of the foreign Buyer to check with his local authorities the extent in which the potentially ordered product may be used. In case of disputes, only the Courts of Belgium are competent.